Just after being hugged by Polly in Belfast, 2014! Polly had heard someone in the Irish Green Party has been working to support her ecocide law work… she was thrilled, a memory I always treasure. 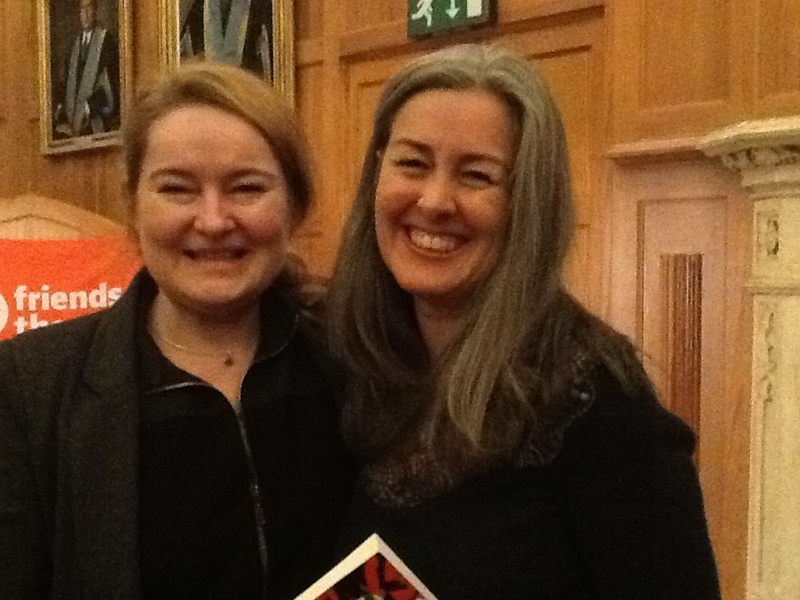 On the 16th March last month, I saw a post flash up on Polly Higgins’s Facebook page connecting Polly Higgins’ work with Greta Thungberg’s globla #schoolstrike4cliamate. Polly is the law expert who has been leading an international campaign for well over a decade now to see ecocide (the manmade destruction of living nature systems) legally recognised as a crime. I have had the honour of meeting Polly twice and she inspired me, even before I met her, to stand up and add my voice that ecocide should be urgently recognised as an international crime. However, in a few days time, myself and other followers, collaborators and supporters of Polly’s work were told shocking news. Polly has been diagnosed with multi-organ cancer and given a prognosis of living only a number of weeks. I was completely shocked by this news but the Facebook group that has sprung up to support reveals she is philosophical and going forward, amidst hospital procedures. It must be so very hard but this sounds so like Polly! The environmental journalist George Monbiot has since written an article on Polly’s ecocide law work – and he quite rightly argues that our greatest means to support Polly at this time, and her legacy, would be to step up and help support her work. I have put the explanatory video of Polly’s Mission LifeForce campaign below. So take a minute to sign up yourself, for all our futures. Some of you might like to look at Polly’s third book too, I Dare you to be Great, not so well known as her first two award-winning books on ecocide crime, but its a message of values and spiritual practices for all of us (check out Polly’s video’s on this topic too). It is extraordinary how Polly has been so dedicated and thoughtful to support us in all stepping forward to help stand for the better world we know is possible. PS: There was a one-line update on Polly’s Facebook page last week (2 April) that simply said they are trying to connect Greta to Polly! 1. sign up as an Earth Protector at IAmAnEarthProtector.org – and get 20 of your mates to sign up too… Polly says she would love to *live* to see #OneMillionEarthProtectors … wouldn’t that be incredible?! Thank you for all that you have done and that heart and voice of yours that has emboldened us all. Daisies are always cheerful – here’s some daisies for you Polly, that thrive every year just in front of wee Hollywood forest in Ireland. The trees have doubled in size now, and in January this year, the Irish government announced a pilot grant scheme to landowners to move towards permanent, non-clearfell forestry.